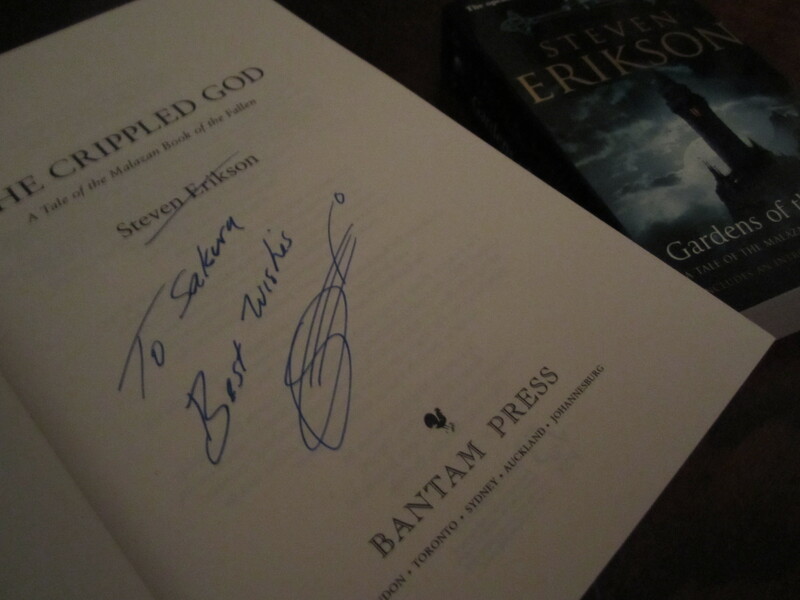 I was SO excited about meeting Steven Erikson, the creator of the Malazan Book of the Fallen, a couple of Saturdays ago that I got to Forbidden Planet on Shaftesbury Avenue a full 45 minutes early and had to hang around the store like a wraith just in case I missed my place in the queue. But I found lots of wonderful and new-to-me sff titles so it’s all good. Even though I’m still only on the 4th volume, House of Chains, I had to get the 10th and final volume of the series, The Crippled God, right? Right? Yeah, I thought I was right. I also got myself a new copy of The Gardens of the Moon because 1) that’s where it all started, 2) I really need to re-read it and 3) my copy, even though I read it only once, had fallen apart due to the extreme humidity of Sri Lanka where I first read it 2 years ago and I couldn’t take that with me to get it signed now, could I? Enough with the excuses. But I wasn’t the only one crazy about the Malazan books. I eavesdropped on several conversations where some of Erikson’s fans had read the whole sequence TWICE. You heard me. And each volume is the size of a brick. And when the guy in front of me dug out 4 limited edition copies of the Malazan novels including The Crack’d Pot Trail, a novella featuring the necromancers Bauchelain and Korbal Broach, I felt a hush and a sudden whispering of ‘That’s The Crack’d Pot Trail!’ and ‘Where did he get his hands on that? !’ It’s so cool to be amongst fellow geeks although in this case, I felt I still had a long way to go before I could call myself a proper, seasoned fan. I actually spoke a little to Erikson who was gracious about having his photo taken, warning me that he was ‘a little hungover’. What a cool guy. Cool! My husband is reading one of Erikson’s books right now and is really, really enjoying it. I haven’t been to a book signing in ages. 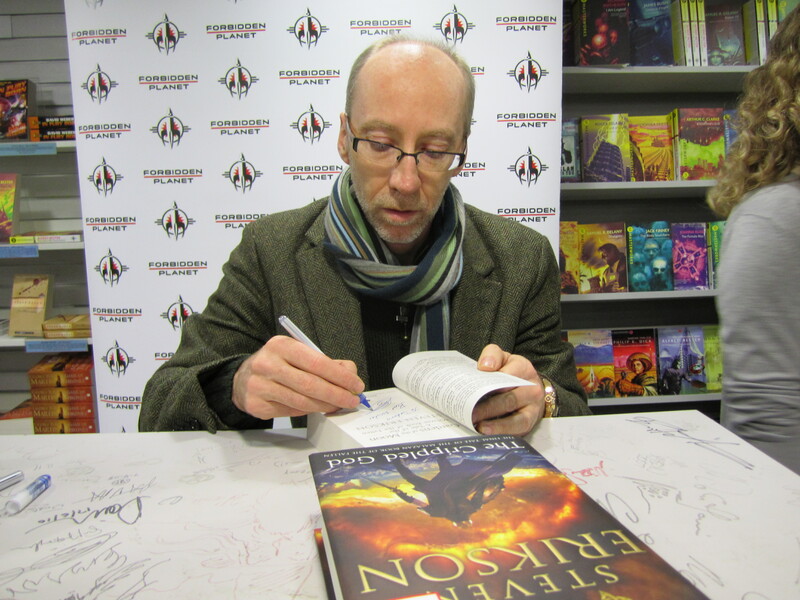 I do love getting a book signed though. nymeth: I hadn’t been to Forbidden Planet in ages and I was berating myself because it’s like a treasure trove for new sff titles and the staff are lovely.